The Entertainment Department onboard a cruise ship is not only responsible for cruise activities but also for production shows and music. 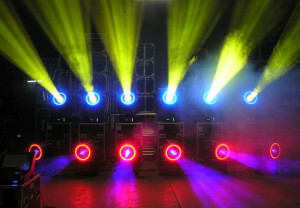 Entertainment technicians provide support with lighting, sound, and automated systems rigging. Today’s cruise lines feature state-of-the-art equipment and require qualified and experienced crew to provide a world-class entertainment experience for the guests onboard. To learn more about the qualifications and experience required, here is a list of the major cruise lines and details on how to apply as an Entertainment Technician. Carnival Cruise Lines – Carnival Cruise Lines recruits their Technicians and other cruise jobs in the entertainment department through their Carnival Entertainment website via an online job application. Carnival’s Technicians include Audio Technician, Automation Technician, Floor Technician, Lights Technician, and Video Technician. Additionally Carnival Cruise Lines work with an approved network of recruitment partners. Their authorized employment agencies help screen and interview potential crew members on Carnival’s behalf. Celebrity Cruises – Celebrity Cruises lists their current job openings on their employment website and qualified candidates are encouraged to apply online. Technical entertainment positions include Audio Visual Operator – Light, Audio Visual Operator – Sound, Audio Video Operator – Fly (Aerial Rigger), Production Manager, as well as Stage and Production Manager. These all fall under the category of Cruise Activities. Alternatively, Celebrity Cruises also recruits for the position of Broadcast Operator / Assistant under the category of Entertainment. Additionally, Celebrity Cruises has a network of hiring partners to assist in meeting recruitment goals around the world. If you don’t see a job posting for a position that matches your qualifications, check with a Celebrity Cruises’ hiring partner. Cunard Line – Visit the Carnival UK Careers website for more information about applying for a cruise ship job in the entertainment department with Cunard Line. Cruise ship jobs include Assistant Manager Production (specializing in Light, Audio, or Automation). Applicants may view current vacancies and apply online as well as register their personal details with the Carnival UK database for job alerts. Disney Cruise Line – Disney Cruise Line’s Entertainment Operations, led by the Cruise Director, is comprised of more than 50 positions in departments including Adult & Family Programming, Youth Activities, Mainstage (The Cast) & Character Performers, Musicians and Technicians. Various levels of Technicians exist within the Entertainment Technician department including Entertainment Technician, Automated Systems Rigger, Show Control, Audio, Senior Technician, Broadcast Editor, Senior Broadcast Technician, and Stage Manager. Applicants can apply online through Disney’s job website or contact a Disney “procurement ally” in your region. Holland America Line – Candidates desiring employment as an Entertainment Technician with Holland America should visit Holland America’s entertainment job pages. Click on the category Cruise Staff to view current openings and apply online. Norwegian Cruise Line – To apply to Norwegian Cruise Line as an Entertainment Technician, visit Norwegian’s employment pages. Norwegian’s website features current shipboard positions available. Applicants may attach their resume in an email along with a cover letter to be considered for a personal or webcam interview. Additionally, Norwegian Cruise Line has recruiting agents throughout the world. If you are from one of the countries that they list on their website, submit your resume to the hiring partner in your region. Oceania Cruises – To apply for a cruise ship job in the entertainment department with Oceania Cruises, visit the employment pages of their website. At the bottom right hand side of their website, click on the ‘Ship Position’ tab for a list of current job openings. Next click on the job title you want to apply for. Applicants may apply through Oceania’s online application form. P&O Cruises – Visit the Carnival UK Careers website for more information about applying for a cruise ship job in the entertainment department with P&O Cruises. Applicants may view current vacancies and apply online as well as register their personal details with the Carnival UK database for job alerts. Princess Cruises – Princess Cruises recruits Stage Production Staff, Assistant Production Managers (Automation, Audio, or Lighting), and Senior Production Managers. Princess Cruises cooperates with a world-wide network of Recruitment Partners to hire for positions in their onboard entertainment departments. Contact the recruitment agency that is closest to your permanent residence. Regent Seven Seas Cruises – To apply for cruise ship jobs in the entertainment department, visit the employment pages Regent Seven Seas Cruises‘ website. Select the option “Ship” for a list of job vacancies. Applicants may apply online for their selected choice. Royal Caribbean – Royal Caribbean lists their current “Job Openings” on their employment website and qualified candidates are encouraged to apply online. Additionally, you can apply online through RCI’s entertainment website. Positions include Stage Staff, Light Technician, Sound Technician, Lounge Technician, Rigging Specialist, as well as Stage and Production Managers. Royal Caribbean has a network of hiring partners to assist in meeting recruitment goals around the world. If you don’t see a job posting for a position that matches your qualifications, check with one of Royal Caribbean’s hiring partners in your region. Seabourn – Seabourn recruits for the cruise ship of Stage Manager. Email Please email casting@seabourn.com if you are interested in one of their shipboard entertainment positions. For information on how to apply with other cruise lines, visit the Cruise Line Employment Information pages.